Who Built The First Shipping Container Home? We covered the complete history of shipping containers. Do you think that when Malcom McLean developed the shipping container he imagined them to be used as building materials? It’s doubtful. Visionaries such as Phillip Clark and Nicholas Lacey certainly did, though. The first official document citing the use of shipping containers as a building material was published in 1962. Who exactly built the first shipping container home!? If we look for the first official record of a shipping container home, we find a man named Phillip Clark. On Monday, November 23, 1987, Clark filed a patent called the “Method for converting one or more steel shipping containers into a habitable building”. Within the patent, Clark outlines how shipping containers can be sited on a weightbearing foundation to create a habitable building. He claimed that shipping containers make the perfect modular building material. He also commented that reused shipping containers can be used to make homes economically. It took two years for the patent to be granted. On Tuesday, August 8, 1989, Clark was presented with his approved patent #US4854094A. If you are interested, the original patent can be viewed here. So where did Phillip Clark get his idea? Was he the first person ever to think that shipping containers could be used to build homes? Far from it. Just two years before Clark’s patent was filed, shipping containers made their way on to the big screen. In 1985, in the film Space Rage, shipping containers were used to make numerous buildings on the production set. We can go further back than that, to the 1970’s, where UK architect Nicholas Lacey wrote his university thesis on the concept of reusing shipping containers and turning them into habitable dwellings. He has since gone on to construct several of these shipping container buildilngs with Urban Space Management. In fact two of their builds, Riverside Building Offices and Cove Park, were featured in our Top 10: Shipping Container Offices. We can still find earlier examples of shipping containers being used as buildings. The earliest official record we could find was from 1962. On Friday, October 12, 1962, Insbrandtsen Company Inc. filed a patent titled “Combination shipping container and showcase”. Within this patent, Christopher Betjemann was listed as the inventor and it states that shipping containers can be used as an exhibition booth when companies are touring and showcasing their products. The patent #US3182424A was granted on Tuesday, May 11, 1965. You can see the original patent here. Why did building with shipping containers become a trend? Within ten years of shipping containers being created, people had the idea to create buildings with them. But why? In the US, we import a lot more than we export. When goods are shipped into the country, we aren’t using the shipping container to export our goods back. This means that there is a surplus of shipping containers. Just how much of a surplus? Well according to the US Department of Transportation: Maritime Administration, in 2012 the US imported 17,541,120 TEU’s, yet only exported 11,935,906 (Source). A TEU (twenty-foot equivalent unit) is a unit of measurement. One TEU is the equivalent to one standard 20-foot shipping container. This means there was surplus of the equivalent of more than 5 million 20-foot shipping containers. Now clearly not every shipping container is left in the US. It would be worthwhile to new containers back to Asia to use again, but a considerable number of containers are left in the US. This trend has been occurring for many years and we have taken a snapshot of some recent data from the US Department of Transportation: Maritime Administration. Since we have such a big surplus of shipping containers in the US, could we not just recycle them? A standard 40-foot shipping container weight 8,820 pounds. To melt down this much steel would take around 8,000 kw of energy, nearly the same amount of energy as a US household uses each year (Source). The average amount of energy used to convert a shipping container into a home takes around 400 kw, which is around a 95% reduction when compared to melting down the steel. Building with shipping containers is environmentally friendly, but not only that, we know that constructing shipping container homes can be significantly cheaper than traditional homes. In our article on “How Much Do Shipping Container Homes Cost”, we looked at homes built for less than $100,000! We know that people had the idea to build shipping container homes way back in the 1980’s. We also know that there has been a surplus of shipping containers here in the US to use. But how did shipping container homes turn into a mainstream trend? The US army helped establish the shipping container as the standard method of transporting goods on ships (we spoke about this here). During the Vietnam War, the US government was looking for a quicker way to ship goods. This is when they adopted the shipping container. The popularity of shipping containers took off after that. During the Gulf War, the US army used shipping containers as emergency shelters because they could be quickly converted and easily fortified. Containers were fortified by placing sandbags against the external walls of the containers. This helped to protect against rocket propelled grenades. After this, in 1994, Stewart Brand, an American writer, published a book titled “How Buildings Learn”. In it, Brand goes on to write ideas about how to convert shipping containers into office space. This was the first publication which mentions building with shipping containers. From here, shipping container homes started to gain momentum and the first completed build we could find on record was the “The Simon’s Town High School Hostel”. The project was conceived when Safmarine donated forty used shipping containers to Simon’s Town High School. The school wanted to use the containers to build a hostel which was capable of housing 120 people at any given time. The project cost a total of $227,000 and was ready for its first lodgers on November 30, 1998. Following the success of the Simon’s Town High School Hostel, in 2006, Peter DeMaria a Californian architect designed the first shipping container home in the US. Known as the Redondo Beach House, the home was approved under the national Uniform Building Code and was completed in 2007. This was the first real shipping container home. This home was designed by Poteet Architects of Texas. 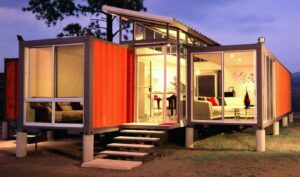 It is constructed from a used, 40-foot shipping container which provides around 320 square feet of living space. Renowned for its incredible cost savings, Containers of Hope was built in Costa Rica for around $40,000. 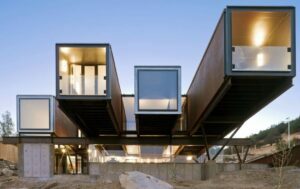 The home was built using multiple shipping containers and is passively cooled with a sloped roof. 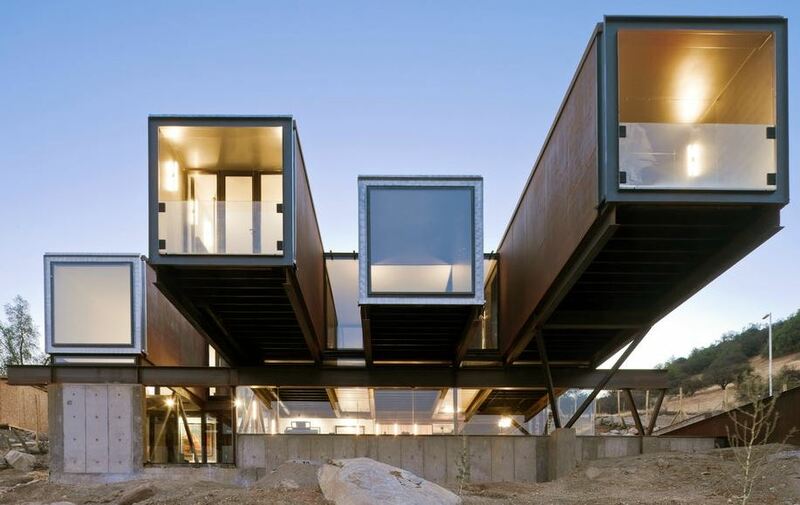 This home was designed by Sebastián Irarrázaval and was built in Chile. In total the home used 12 containers and is 3,800 square feet. It was built on a hillside just outside of Santiago where the owners get some incredible views! The popularity of shipping container homes continues to rise and there appears to be no stopping these sustainable, affordable homes. If you want more information, read amazing uses for shipping containers. 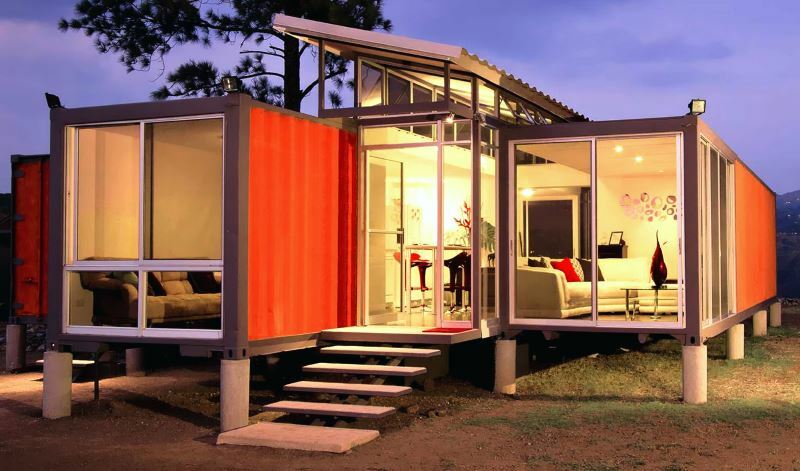 Let us know your thoughts on the origins of shipping container housing below in the comments.